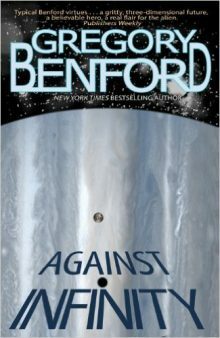 A gripping, masterfully written adventure set against the violent beauty of a planet in the throes of cataclysmic transformation, “Against Infinity” is Gregory Benford’s timeless portrait of a young man’s coming of age. On the icelands of Ganymede, a man and a boy hunt for the Aleph—an alien artifact that ruled Ganymede for countless millenia, Infinitely dangerous, the Aleph haunts men’s dreams and destroys all efforts to terraform Ganymede into a habitable planet. Now an ancient struggle is joined, as a boy seeks manhood, a man seeks enlightenment, and a society seeks to survive.